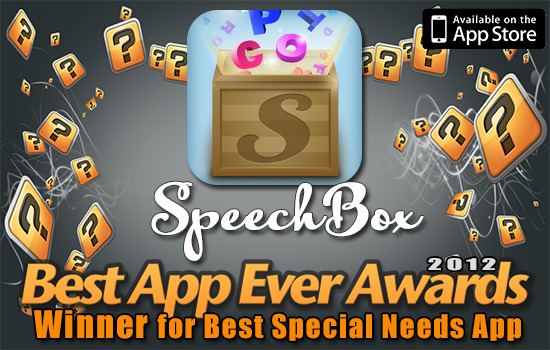 We are excited, honored, and pleased to report SpeechBox for iOS has been Awarded 1st Place in the 5th Annual Best App Ever Awards, Special Needs Category! We could not have achieved this without all the support from our users, parents, therapists, and others in the special needs community. Thank you so much for your vote, we are deeply honored. We look forward to releasing more apps and further updating SpeechBox. Read more at the Best App Ever Awards.